The Empas auto-rollable spring hose reels are constructed in a very compact manner and are equipped with a high impact powder coating. Because of the sophisticated spring construction this reel runs particularly light. By means of the turnable hose conductor, positioned on all spring reels, the direction of the run can be selected. 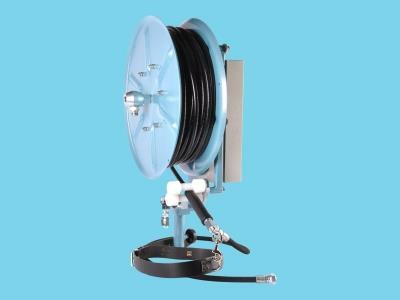 The hose conductor will take care of a good distribution of the hose on the reel. In a standard manner the reel is manufactured with a swivel coupling equipped with a stainless steel pen. To render use of the reel as easy as possible and to reduce the load of the elasticity during the work a strong belt and a supple coupling hose are also provided. This reel will, in a standard manner, be delivered with, as desired, a 30-metre 3/8" nylon hose with an operating pressure up to 100 bar.